This classic 5 bedroom home offers privacy, beach rights, and water views. The standalone dwelling on Hulbert Avenue is located on the same grounds and adjacent to a main 8 bedroom, oceanfront residence. Access to the private beach is just steps away across the lawn. The first floor offers a living room, dining room, kitchen, 1/2 bath and laundry room . The upstairs has a newly renovated full bath with a tile shower and a standalone tub. There are three 3 bedrooms upstairs: two singles and a twin bedroom. A wing off the first floor has a master bedroom with king size bed, a newly renovated full bath with tile shower, and a fifth bedroom with 2 twins, which can also serve as an in-law suite or family recreation room. Amenities include a dishwasher, washer/dryer, cable TV, Internet, BBQ grill, and an outdoor shower - and linens are provided. The outdoor deck is great for entertaining and has views of the entrance to the harbor to watch all boats come and go. 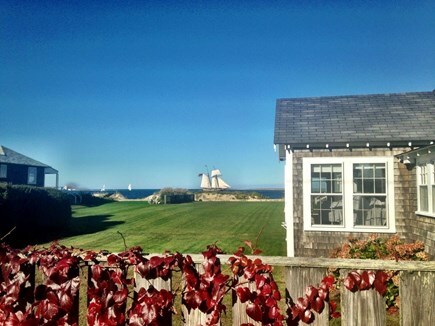 A few short steps across the expansive lawn is the 100 foot wide beach. 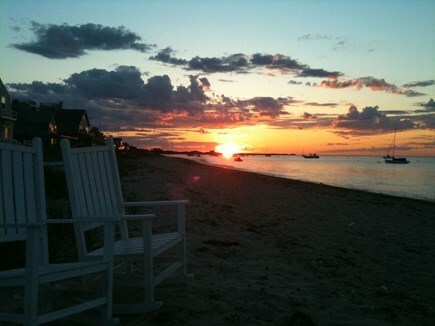 Enjoy swimming, or stroll along the beach to Brant Point Lighthouse or to Jetties beach. The property also includes rights to use a tennis court across the street. Additional pricing info: 6 hours of cleaning included in weekly rate, State and local taxes of 11.7% will apply.